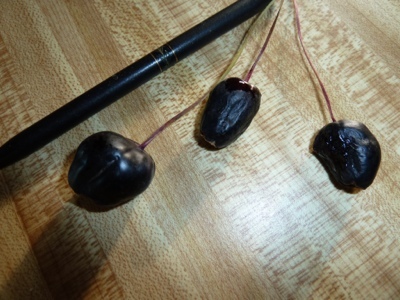 My Home and Garden: Seed pods the size of cherries!! Largest fuchsia seed pods I have ever seen. Wow. You can see my old Cross pen beside them. The big one is about an inch across. I was just nipping seed pods off my gigantic fuchsia perennial. The flowers are about three inches across. The seed pods are usually a bit bigger than normal ones. I could not believe what I was seeing. Can you eat them though??? The Edible Ornamental Garden, Bryan & Castle, says yes seeds are edible. Recommends darker seeds are more tasty the light. What did his strain is this?